Boring Emo: Tell us about writing process of this album. It was 7 years after you released Parselene, so what was happening? Were you writing all this time, or were there some obstacles that resulted in such delay? Kent: Hi Kent (vocals, guitar) and Katsuta (guitar) is answering this interview. Yes, seven years seems to be a long time, but we were always working at own pace. We had a European tour, a Russian tour, a Japanese tour with DEAFHEAVEN, etc... So the band has been moving all the time. About two years ago, it seemed like a good time to settle down, so we talked about which way to got next. As a result, we decided to put out a new album. Katsuta: First of all, I’m sorry for the delay. And I know I have to explain it. 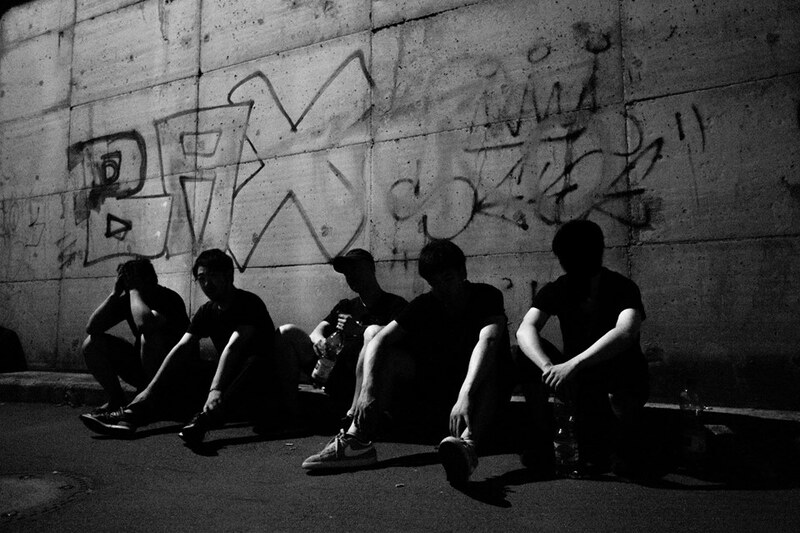 In 2015, our drummer took part in ENVY as a supporting member. So we had to take a short rest to recover and produce something creative. After all, it takes a lot of time time to release WHITE HALO. But thanks to this term, I think we were able to make a masterpiece. Boring Emo: Is this album a concept album like Paraselene? What's the meaning of the title? Katsuta: This album didn’t have any overarching concept. I was focusing on making each song better individually. Because I didn’t want to make same album as previous one. Besides, I had to make sure not to package similar songs in this album. You know that the new album title contains “White”. It means growing out of our previous “black” image in a figurative sense. Kent: Simply speaking, We want to change our image from Black to white with this album. This is one of the strong concepts in the making of this album’s title. Also, it is interesting that a white rainbow penetrating the sun is also a sign of a great disturbance. Boring Emo: There's a significant change in your sound on this album, you're much more metal now, is that something that all members were leaning towards to, or that was one guy, and others just kinda agreed? Katsuta: I love heavy metal music very much, and I am absolutely a headbanger but I don’t think we are metal now. Because I hardly express "hatred" or "aggression" like typical metal bands do. For me, what is important about our songs is that they are conceptual. In other words, our songs express words like "salvation" or "deliverance"...because I want to forget this real world and lose my mind during writing songs or live shows. And I wrote all the songs for this album, but the creation process is not egoistic. We always discuss everything, no matter how insignificant. Boring Emo: What was recording process like? Was it just a regular thing, or maybe there were some completely new things for you? Some hardware or instruments, or techniques you never used before? Katsuta: The recording process changed somewhat compared with the previous release. I tried to use some software instruments like strings, piano, harp…etc. Finally it worked out pretty well. So please listen to our new album carefully. You can notice various tones in some phases and feel how the sound layers and harmonizes. Boring Emo: If it’s possible, give us a tour through the songs on the album, like track by track commentary. You can talk about your initial ideas, sources of inspiration, the meaning of the lyrics, some stories about the recording process etc. Katsuta: I'm sorry. I don't want to spoil the experience... please listen to WHITE HALO freely. but if i can beg you to do one thing, please listen to album from beginning to end. It may lead you to a new world and you can feel what we want to express more deeply. Kent: As for the meaning of the lyrics, each song has its own personal theme. It’s much too private, I will not talk much about it. Nonetheless, it is not all desperate. There are things to be pessimistic about indeed, but I think that I want to take a shape that would still be “saved”. It’s an image that will be “purified” if that is not too dramatic a word. It may be that there was also a reaction to that, as the previous work “Paraselene” was introverted in its lyrics. We are tired of using too much Black. And I think that it’s easy for an HC band to play with a black and dark worldview but that it’s more difficult to put ourselves in a white and shining worldview. We think we should try to break out of our shell at this time. Boring Emo: When should we expect your new record? Will it be in another 5+ plus years, or maybe you already have material for it, and it would be in a matter of year or two? Katsuta: What a difficult question…! But I hope we can release another in 2020. Come see us for the TOKYO OLYMPICS in the meantime!